New for the specialty toy market, Dado™ combines art and science as kids of all ages explore architectural principles —proportion, balance, structure and color. 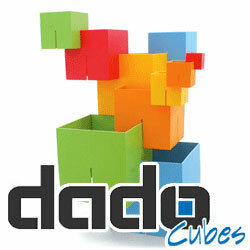 A new twist on classic building blocks, Dado™ engages the imagination as the slits on each cube are interlocked to create an unlimited number of three-dimensional structures. 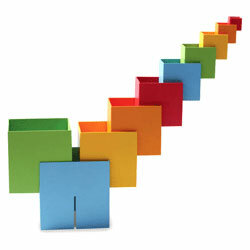 Constructed horizontally, vertically or nested together, Dado™ invites visual spatial development and problem solving through design-centered, attention-grabbing fun! 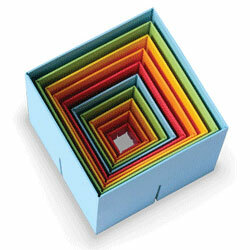 Each set features 10 cubes, scaled from 1" to 5"
Developed, manufactured, and assembled right here in the U.S.A. Apply for wholesale account online at www.FatBrainToyCo.com and mention that you found us on ToyDirectory.com. Click here to see some of the products Fat Brain Toy Co. has shared with ToyDirectory and TDmonthly Magazine.